In 2014, Julie Hatcher from Dorset Wildlife Trust (DWT) contacted CSGRT about setting up a seal photo identification project on her patch. After a successful collaboration, two years down the line we have our first (and very exciting) seal photo ID link up – adult female ‘Molar’ aka ‘Gamboling lamb’! Named after the distinctive black patterns on the right side of her neck, this beautiful adult female was first photographed by CSGRT volunteer Rob Wells on 07/11/14 in St Austell Bay (coincidentally around the time the Dorset project was being set up!) Rob was initially disappointed that she couldn’t be identified but Molar was added to his photo ID catalogue…little did we know she would become such a celebrity! 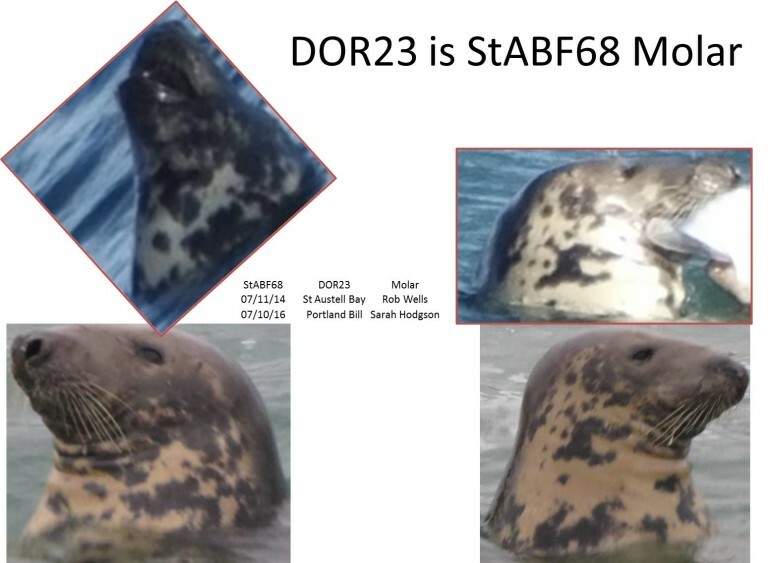 Check our ID for yourself….the two bottom photos were taken by Sarah Hodgson off Portland Bill and the top two with red borders were taken by Rob in Cornwall. Can you spot the matching patterns? Molar has already caught the attention of the media: http://www.itv.com/news/westcountry/update/2016-10-20/grey-seal-molar-makes-a-comeback-off-dorset/ and http://www.blackmorevale.co.uk/dorset-wildlife-trust-seal-project-celebrates-return-of-molar/story-29825711-detail/story.html! This discovery comes a year after CSGRT got their first Cornwall and south Devon seal link up thanks to volunteer Bob Earll. Interestingly these two seals were also originally photo identified by Rob, although one of these seals has subsequently been seen on the north cornish coast photographed by Sue too. Cornwall has been linked to north Devon by seals since 2009 thanks to the work done there by Dave Jenkins. So, if you spot a seal anywhere around the SW – north or south coast, email [email protected] with the date and location – photos are a bonus and offer the chance that your sighting will lead to another new discovery! Huge thanks to the many wonderful participant volunteers who have enabled this seal story to be jigsawed together! Photos at top of page and the featured image on the news page are by Sarah Hodgson DWT.